WASHINGTON, May 18 (Xinhua) -- China-proposed Belt and Road Initiative offers connectivity crucial to world development, Chinese Ambassador to the United States Cui Tiankai said here on Thursday. 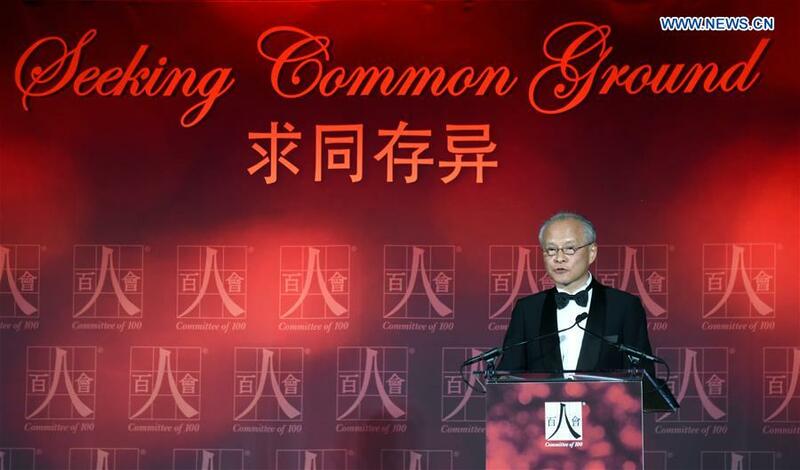 "Just as blood vessels bring life to the body, if we want to bring prosperity to every corner of the world, we need connectivity," said Cui at the 2017 Awards Gala Dinner held by Committee of 100, a U.S. non-partisan organization focused on U.S.-China relations. "The Belt and Road Initiative offers just the right spirit and tools that connect countries and peoples," he added. Calling the initiative "constructive and forward-looking", Cui said the connectivity it offers will help people worldwide to make joint efforts to address the global deficits in peace, development and governance. "We are encouraged by the positive response from the international community to the initiative and the success of the Belt and Road Forum in Beijing," the Chinese ambassador said. "China is ready to work with all parties, including particularly the United States to translate this grand idea into reality." Cui also said that when Chinese President Xi Jinping and U.S. President Donald Trump met at the Mar-a-Lago estate in Florida last month, "the essence of that meeting was also about fostering better connectivity between China and the United States." "Such effective exchanges between our two presidents point the way forward for the China-U.S. relations and enable the two sides to manage differences constructively, and to keep our relationship on the right track" said Cui. China firmly believes that a good China-U.S. relationship benefits both sides and the world at large, he added. "Cooperation is the only right choice for us. To promote mutual understanding and win-win outcome through exchanges is the road we must travel on," said Cui.